With the season well under way, and an abundance of snow falling in regular bursts, our staff have really been able to venture far and wide throughout the Portes du Soleil. So we thought we’d get a little insider knowledge and find out which pistes are their favourite and why. My favourite run is cold shoulder on the Mont Chery side of Les Gets. It’s got some nice lips to practice tricks and to ride switch, and barely tracked powdery bits, secretly hidden away behind trees when it’s been snowing (which is all the time this season!). My favourite run is the Perrier red. The wide, open pistes are amazing, and being at the far end of town it is often quiet. There’s plenty of snow just off the piste to play around in, and the new video park is a great opportunity to compete with your friends and watch it back. One of my favourite runs is the red Lievre on Mont Chery. I like it because Mont Chery is always quiet, even during the peak weeks, and it’s a lovely wide run with intermittent steep and flat sections. It also starts with the snowpark so really it ticks all the boxes! I love the slalom run just off the Tulip. This is a mountain bikers’ track in the summer but is turned into a fantastic slalom course in the winter. It’s not only a really exciting run but is very pretty too as it winds through the trees. I’ve gotta go with Sinead and Dan on this one and say Mont Chery also! There’s some awesome off-piste to be had to the left of the Epervier run. It’s not too steep, yet steep enough to keep some good speed, and is quite technical as you have to negotiate through the trees to stay in one piece. I believe Jim might have come a cropper on this run a few seasons ago – amateur! 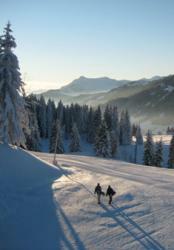 My favourite run is Le Linga which runs from the top of Linga into Chatel. This is one of the runs that I like to take our guests on when we do the tour of the PDS on Tuesdays and it’s a real thigh burner as it just goes on and on! It’s not the most technically difficult run, it’s more of a cruisy motorway red, but if you can do the whole thing in one go you’ll certainly have earned your beer at lunchtime! I’m with Jim on this one, and vote for the run from Linga to Chatel. The top section is nice and steep so you can get into a great rhythm with some bouncy turns, then it’s beautiful cruising all the way to the bottom. I just wish my knees would hold out long enough so I could do it all in one go!